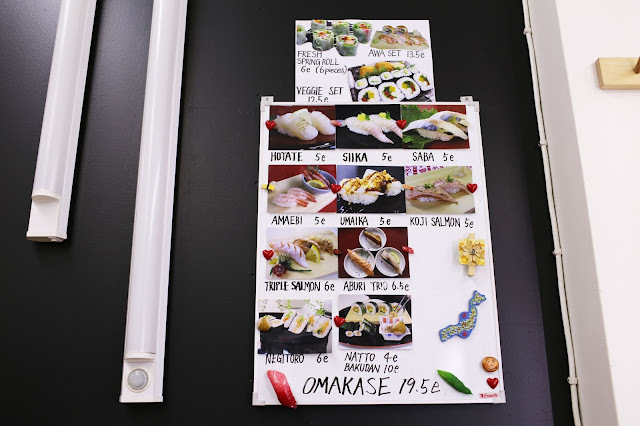 While visiting Helsinki, I was exciting to visit Sushi Wacogoro for lunch. 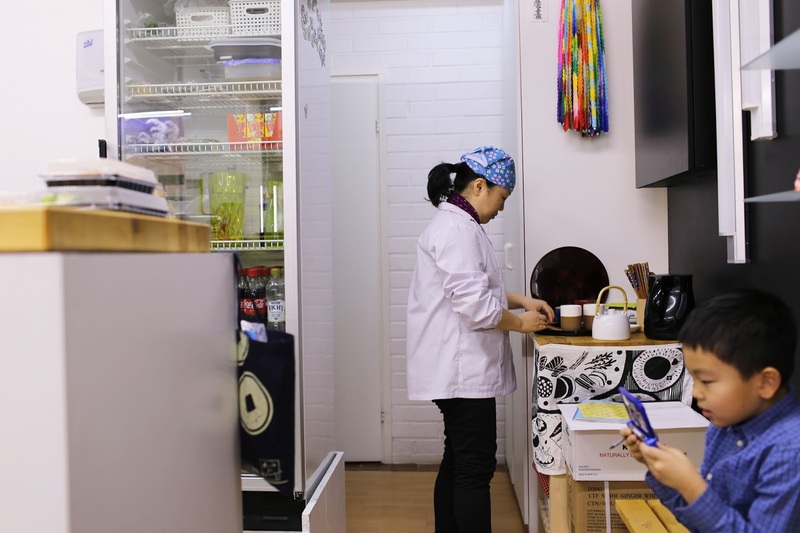 While looking through Helsinki's recommended restaurants, there are many Japanese restaurants to choose from. However Sushi Wacogoro's 5 Yelp-star status really makes me wonder. While reading about the background of the restaurant, it is actually owned by a Japanese family who moved to Helsinki for more than 4 years, solely to seek an opportunity in sushi business. 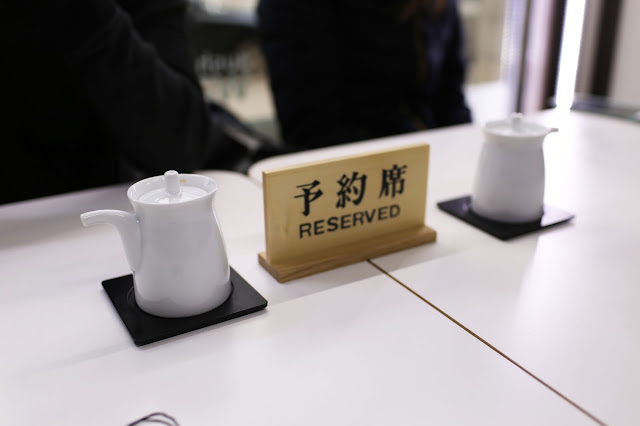 My friends and I planned to call in and reserved a table to make sure we can dine in without missing any chances! Comparing to the gloomy, cold weather outside, it is clean and bright inside the small shop. There are only 3 tables in the although most people order to-go. The family also has a child, who was staying at the shop throughout the entire time. I wanted to try a little bit of everything, so I ordered a Omakasa, which is a Japanese phrase that translates "I'll leave it up to you." 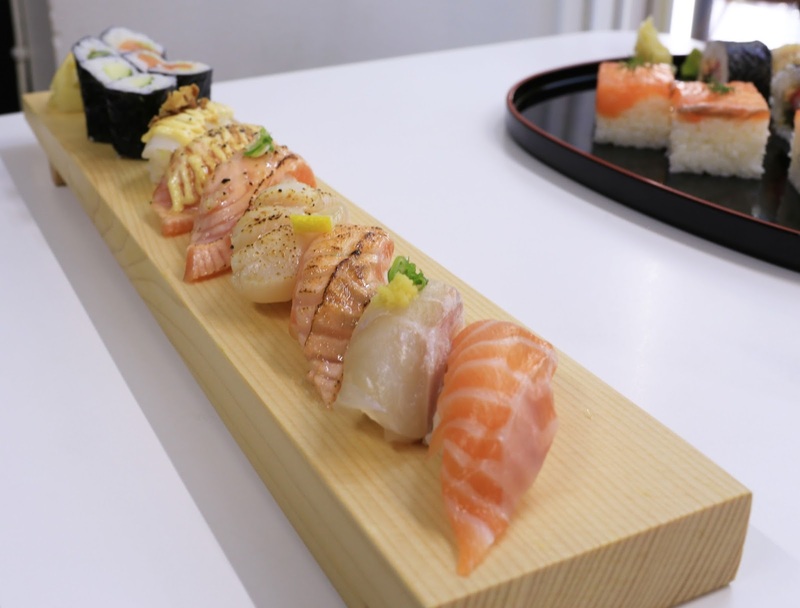 Serving on a long wooden sushi plate, the sushi looks more appetizing and delicious! Oshizushi is something that I wanted to try a long time ago. 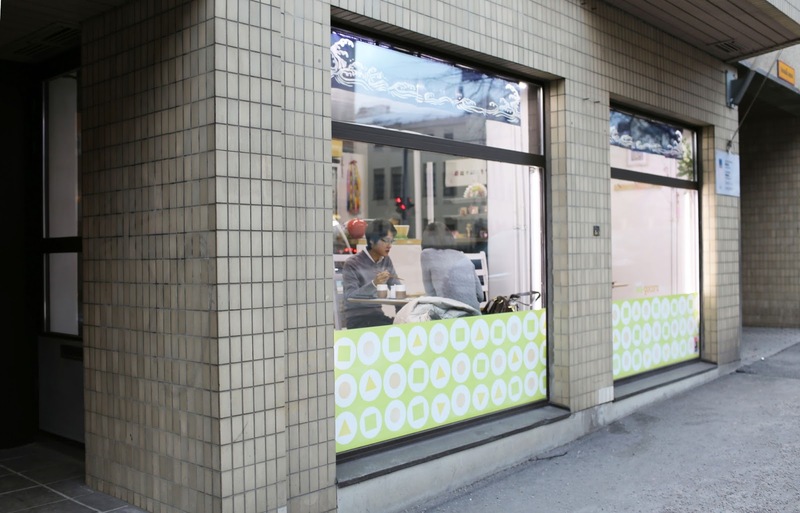 Oshizushi 押し寿司 means pressed sushi in Japanese. 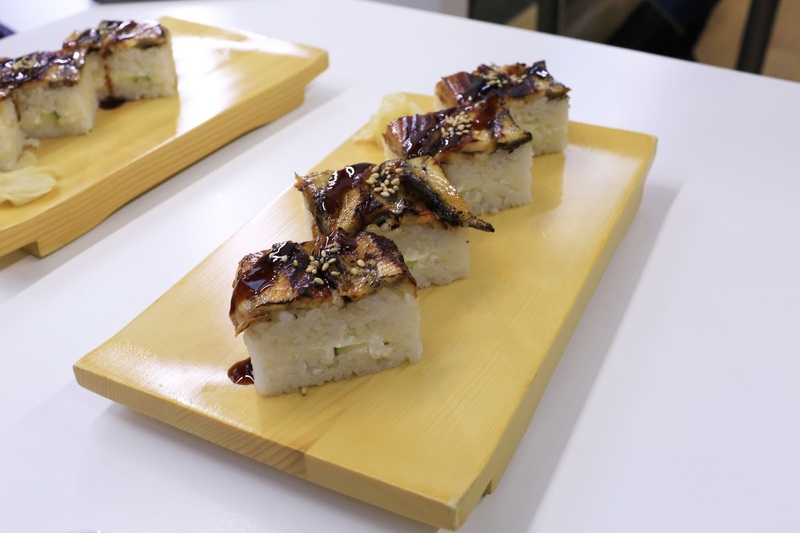 It is made with a wooden box that specially for making the rectangular-shaped Oshizushi. Server specially told us there is cucumber and cream cheese inside, which I really hesitate in trying. I am not a fan of cheese, but it actually tastes really good with only subtle flavor of cheese while the eel glazing will eventually overpowering. You might ask what is the difference between Oshizushi (box-pressed) and nigiri (hand-pressed)? 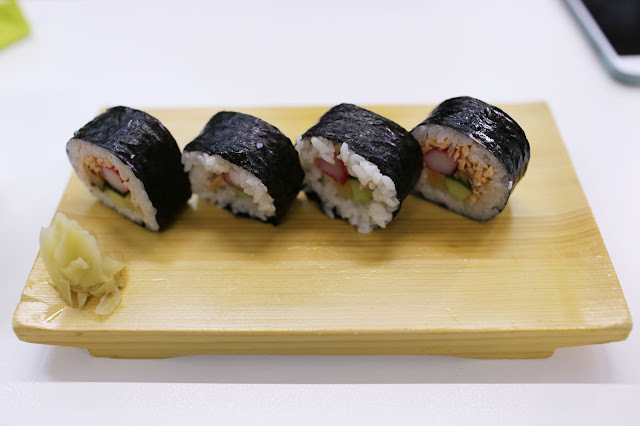 Oshizushi is more dense which the advantage is to be able to add ingredients like cream cheese and cucumber that will easily loosen up inside the rice. It adds flavors and freshness to the sushi that topping or the rice itself can't provide. Futomaki 太巻 is a larger version of a maki roll. It translates to be "big or fat roll." 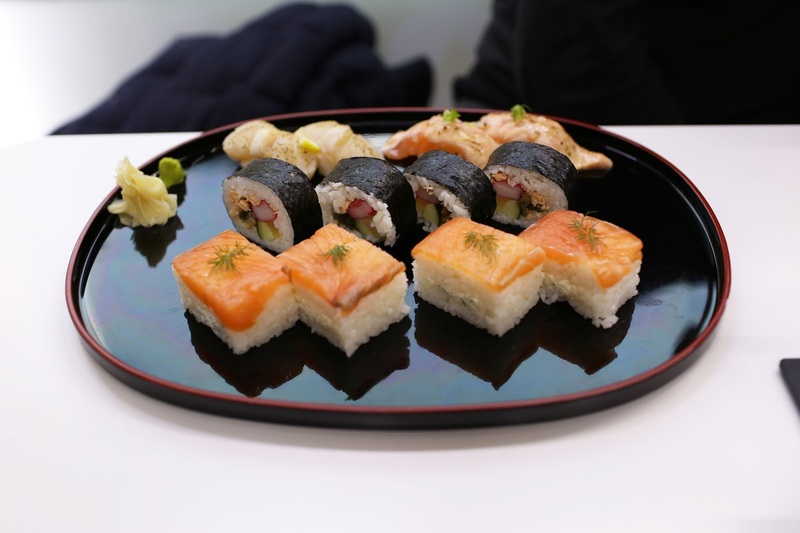 Inside the roll, it has cooked salmon, unagi, crab stick, cucumber, and pickled daikon. Futomaki - literary translated "big roll"
Dem Sushi! I love sushi! Unfortunately, I can't eat raw tuna or yellowtail. Luckily, I actually favor salmon so I'm good. 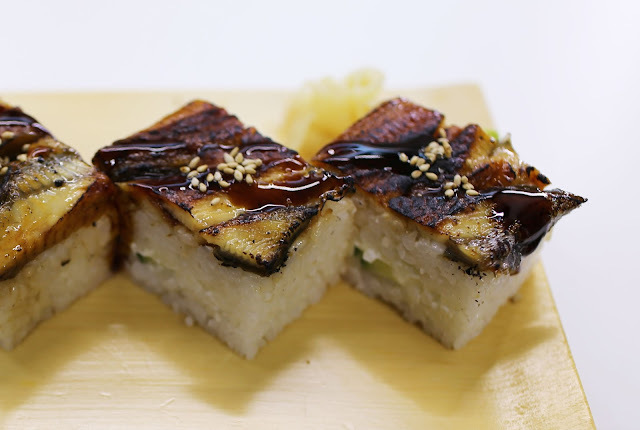 Ever tried grilled scallop sushi? Those are good! Nice! Great to hear you love sushi as well, Aim! I think you can't really go wrong with scallops. They are just delicious! 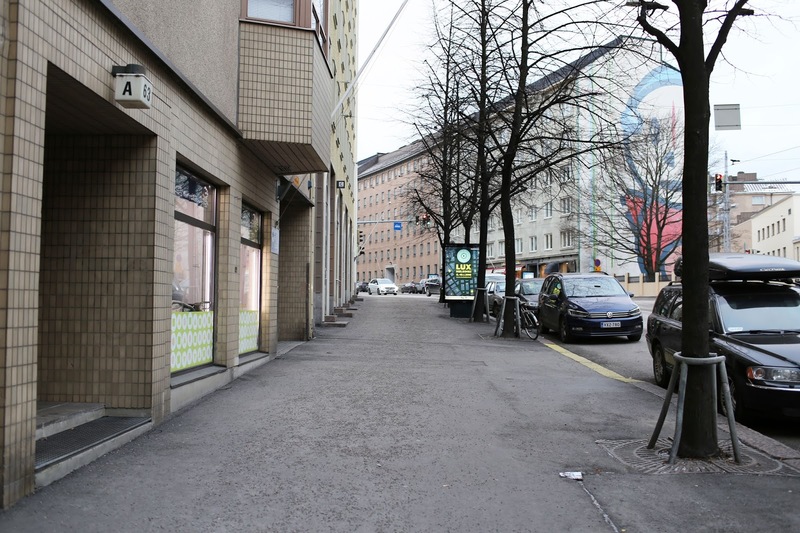 I will be going back to Finland soon, this is good to know. 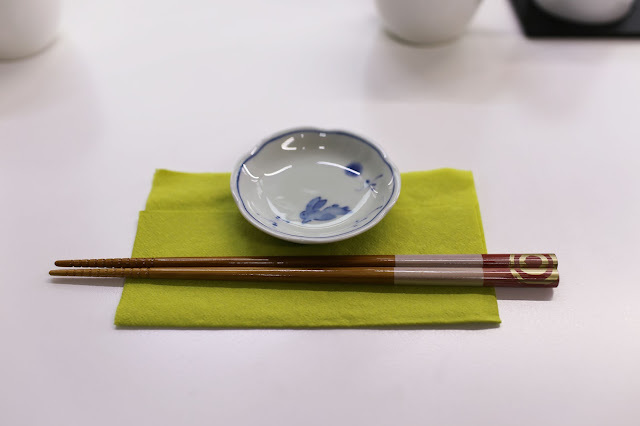 OK, I think I never tried real Japanese sushi, in the places where I tried some countries sell it cold (not freezing) but in other countries hot, how it's really in Japan, btw I love sushi, I can eat a lot, but really a lot. Those pictures as always makes me feel hungry no matter if I'm full already. Wow, another good reason to visit Finland ! Looks like a good stop on the way to see the Northern Lighs!